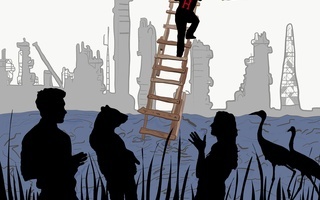 The authors are members of the Harvard Prison Divestment Campaign, a collective that includes more than a dozen Harvard students from multiple schools. UPDATED: Oct. 15, 2018, at 1:39 p.m. Since 1983, there have been over 1,000 documented cases of American police or correctional officers killing civilians by using Tasers to subdue them. Not included in that figure, however, are people like Martini Smith, who, in 2009, survived being shocked while in a holding cell in Ohio, but miscarried her unborn child just five days later. Video footage released last year of Smith and others whom officers tased in custody prompted the U.N. special rapporteur on torture to declare that the sum of these incidents “constitutes a grave violation of human dignity” and may well qualify as torture. This declaration helps explain why Taser’s manufacturer, Axon Enterprise, Inc., has settled dozens of wrongful death lawsuits for untold sums of money. What remains unexplained, however, is why Harvard, the nation’s oldest and wealthiest institution of higher education, holds stock in Axon, through an iShares Core S&P Small-Cap ETF fund. In fact, Harvard profits off of many such holdings within the prison-industrial complex. Some of these companies like the private prison operators CoreCivic and the GEO Group, to which Harvard is connected through a related Mid-Cap ETF fund, profit from owning immigrant jails that serve as sites of detention for undocumented immigrant families. Moreover, just days ago, it was revealed that conditions in GEO Group-run Adelanto immigration detention center had driven several people detained there to attempt suicide. Other companies, including the insurance giant Tokio Marine Holdings Inc., a key player in the $2 billion a year bail bond industry, make money off millions of people, like Kalief Browder, who are simply too poor to finance their freedom and turn to private bail bondsmen. Unable to afford the sum owed to bondsmen, Browder was incarcerated for three years at New York City’s Rikers Island jail, two years of which he spent in solitary confinement. His experience at Rikers drove Browder to commit suicide at his family's home in the Bronx in 2015. The Harvard endowment pours $14 million into a Vanguard FTSE Developed Markets ETF fund that holds over 3 million shares of stock in Tokio Marine. Due to the fact that the University publicly discloses just $425 million — barely one percent — of its total endowment holdings, these examples likely represent only a small fraction of Harvard’s investments in prisons. 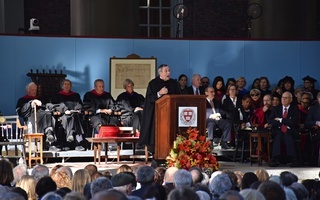 During his installation address last Friday, University President Lawrence S. Bacow implored the audience to note that “the goodness of Harvard [...] lies in the three essential values we represent: truth [...] excellence, and opportunity.” Yet the truth is that Harvard cannot claim to be excellent if it makes money from investments in companies that destroy the life opportunities for millions of people across the country, who are disproportionately black, brown, and poor. 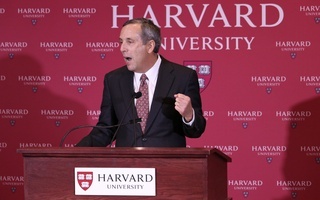 Bacow later in his address remarked that “there are both reassuring truths and unsettling truths, and great universities must embrace them both.” If Harvard is a great university, it must face the truth. By investing in corporations like Tokio Marine Holdings, GEO Group, Axon, and others, Harvard is complicit in the ongoing moral disaster that is the prison-industrial complex. Mutual fund managers pour hundreds of millions of dollars into the prison-industrial complex, and universities like Harvard pour millions of dollars into their funds. A growing coalition of students across the University’s many schools have formed the Harvard Prison Divestment Campaign to hold Harvard to its stated ideals. We are calling on Bacow and the Harvard Management Company CEO N. P. Narvekar to disclose and divest the full scope of our holdings in the prison-industrial complex but also to take meaningful steps to repair the harm that the University has already inflicted through its investment choices. We call on Bacow and Narvekar to re-invest the divested funds in local organizations, initiatives, and companies, led by people directly impacted by the prison-industrial complex. They should also create funded academic programs and projects that hire scholars and grassroots organizers to teach and research creative approaches to eliminate structural social harms in ways that do not rely on prisons and police. Harvard enriches and is enriched by a system that keeps 2.3 million souls in shackles and millions more under surveillance. The only truth more unsettling than that would be indifference to these facts, which would indict our own inhumanity and ignore our collective complicity with injustice. This is not an inevitable state of affairs. We can construct an endowment — and hopefully a society — without reliance on prisons and police. If our motto of “veritas” means anything, indeed we must. Jarrett M. Drake is a second-year Ph.D. student in Anthropology in the Graduate School of Arts and Sciences. Paul T. Clarke is a third-year Ph.D. student in African and African American Studies in the Graduate School of Arts and Sciences. Anneke F. Dunbar-Gronke is a third-year student at Harvard Law School. 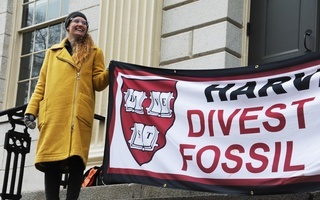 The authors are members of the Harvard Prison Divestment Campaign, a collective that includes more than a dozen Harvard students from multiple schools. A previous version of this article incorrectly stated that CoreCivic and the GEO Group profit from jails housing undocumented children separated from their families. In fact, neither company operates jails that house undocumented children separated from their families.